Sigh. The Runway. PR. Project Runway, my #1 obsession of the moment. I seriously want to go to Mood, pick out my fabric and design my heart out. One of these days, I will buy a sewing machine, ya hear? And I am going to make me a new wardrobe. And I will make my pup a sweater to humiliate him, only he won't be humiliated see cause it's going to be the niftiest sweater on the block. One day. It's going to be Fa-abulous! My favorites are Amy, Seth Aaron, and Jay. Who are yours? I do, I love the Idol. But I have to watch it by pausing live tv via dvr and start watching a half hour after the rest of the world. Why? Because, I just can't stand to watch them commercials. And you know what else, I really don't care to watch them talking before their performance. I want to judge them solely on their singing and song choice. I don't care if you just had a baby, if you were sick last week, or stubbed your toe on the way to the stage, I just want to hear you sing! And boy do I get up in arms when people get through based on being "cute" if they "can't sing." Now will someone please tell me why is Kara sitting on top of Simon this season? Is she trying to get away from Ellen or sit on Simon's lap and whisper sweet nothings in his ear? My favorites this season, oh and you know what else? My favorites in the beginning usually don't get very far so I may be jinxing here, but I like Lee, Mike, Siobhan, and Michelle. I really do actually like it though when one of the ones getting by on "cute" in the beginning get a lot lot better by the end, then I root for them. But I wouldn't have voted for them. And I do vote. Sad right? Come to think of it, those are the only 2 I'm obsessed with right now. When they are on, and thank goodness they are not right now because I would be such a couch potato, but I also get hooked on Top Chef and Design Star. Oh dang and Survivor too, I just keep remembering more. And all 3 - Survivor, Idol, and Project Runway are all on TONIGHT. That's 3 hours of quality tv watching time ahead of me. So, he wears his scrubs a little snug, I enjoy the man's show. Informative, humorous, honest. Everything you never knew you always wanted to know about your body. Did you ever see him lift up what 5 lbs of body fat looks like? Eeeeew! I wonder what's with that photo? I found it here. Clearly, this is set up as a photo shoot, but this shot seems to be saying, "Haha! 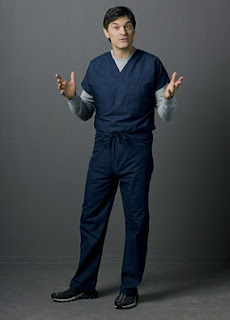 Dr. Oz, you think you are so cute but I will post this picture of you when you didn't know I was snapping, just when you were asking - Where's the beef?!" This spoken by a snurly camera, clearly jealous of the good Dr.'s success. Dr. Snug Scrubs. Try to say that 10 times fast with your eyes closed and one hand in the air. My sister LITERALLY went into withdrawl when Project Runway went on hiatus last year! I was ready to call an intervention!! Don't worry, there's plenty of us "Reality Addicts" out there! I am a huge reality tv junkie! I've gotten better over the years - but I love Dancing With The Stars and sometimes I really get into the Bachelor - just not this past season. I've never watched Project Runway though - but I have plenty of friends who swear by it. PS: can't wait to get the perfume! Oye! I'm so excited!!! Dancing with the Stars! That's another I can get carried away with. I hate the Bachelor but know what, I still watch it all the time. They've been picking old contestants to be the new bachelor/ettes otherwise I could stop that addiction. I just hate the idea of knowing the person you are dating is also dating 20 others. No thank you!